The current incarnation of Haruie Kakizaki, originally male. Somewhere in her past, whether by accident or design, she switched gender. She is a female college student about 21 years of age who rides a Yamaha FZR400 motorcycle called "Ecchan". Despite her decidedly feminine appearance, everyone calls her by "Haruie". She is easy going and friendly with a bit of a competitive streak. When she first meets Takaya, she challenges him to a motorcycle race and beats him easily. She is a powerful exorcist and dependable in combat. 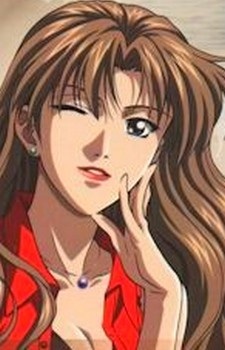 In the OVA series, Rebels of the River Edge (2003), her past experiences are developed in greater detail.